Surviving Dreaded Conversations gives managers all theyneed to get through those difficult, face-to-face conversationswe all encounter in our office. Whether it'sfiring an employee, asking for a raise or delivering badfinancial news to a client or staff, expert author DonnaFlagg shows readers how to stop putting off theseuncomfortable conversations and start successfully facingthem head-on. 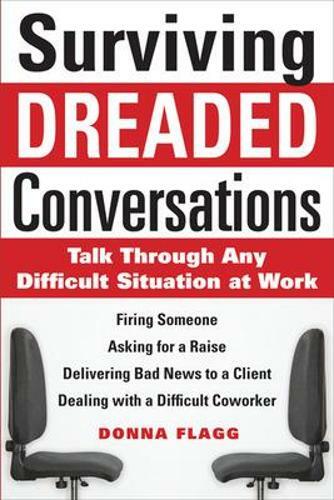 Filled with tips, strategies, exercises,and easy-to-memorize scripts for effective preparation,Surviving Dreaded Conversations is packed with practicaladvice to help professionals get through the roughspots in the workplace.